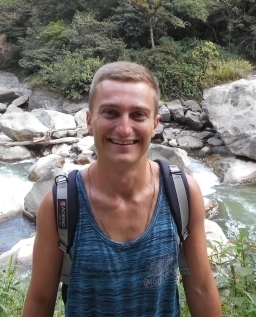 Psychosis and Major Depression overcame Christopher in Ecuador. Christopher’s body, mind, and spirit served him well for the first half of his life. Despite dyslexia, he initially learned to read and write in a foreign language. He attended Spanish Immersion Elementary for 6 years and swam on Team Santa Monica for 5. He worked as a Life Guard and taught youngsters to swim at the Santa Monica College Pool. He was an honor student and American Field Service exchange student to Finland. For several years, he volunteered in Sierra Service Project and other charitable activities through our church. He earned the Gustavus Adolphus College Presidential Scholarship for the three years he was a Gustie, before transferring in his senior year to Murdoch University in Perth, Australia. He graduated with a Chinese Business major. Having studied Mandarin, he founded his own Chinese import business in Perth with his Chinese girlfriend, but when she died unexpectedly, he moved into the Solar Design and Sales industry in Hawaii for 3 years. Wanting to “do good in this world,” he relocated to Ecuador to start an organic farm. He accomplished little to that end, as he was overwhelmed with Psychosis and Major Depression. Diagnosed in his teens with Depression and Anxiety, he accepted talk therapy and medication for 11 years. Then he stopped his meds wanting to feel “who I really am”. He was convinced no professional could help him. Delusional, he tried to end his torment in 2016. Though I was able to bring him home for a few months, he ran from us back to Ecuador. He refused help continuously as his relentless paranoia isolated him from his much-loved sister and mother, girl-friend and father. His inability to trust anyone was terrifying for him and for us. Our only comfort now is that he is finally free of the mental demons that devoured him daily. He is out of pain at last. Throughout the dark days of his illness, NAMI (National Alliance for Mental Illness) has been a godsend to my family and me. NAMI Westside’s “Family to Family” 12-week free course, its weekly support groups, and its “Peer to Peer” group (which Christopher actually attended for 4 months) are examples of the life-affirming work NAMI undertakes. Caring people ask what they can do for Ariel, Larry and me. A donation to NAMI Westside in Christopher Bandasch’s name, in any amount, will help others and their families impacted by chronic brain disorders. For this and for your loving words, we are deeply grateful.